Restaurant Equipment Baby (shouldn’t she be called “tadpole” or something?) is growing up fast. She’s taken to watching various educational programs that stimulate her developing brain – shows like Little Einsteins and Chuggington. If you’re not familiar with Chuggington, it’s a British computer-animated show for kids set in the fictional town of Chuggington. 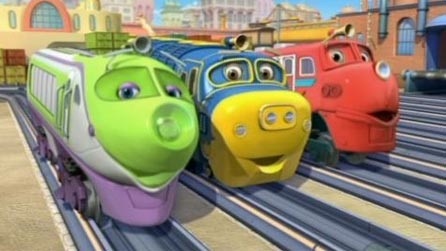 The main characters are talking locomotives with cute names like Hoot and Piper. The show, set in and around the Chuggington depot, promotes the values of friendship, honesty, and peaceful conflict resolution. It reminds me a bit of Shining Time Station, another educational train-related show I remember seeing glimpses of as a youth. Shining Time Station took place in a depot and starred Ringo and George Carlin as Mr. Conductor. George Carlin on a kids show sounds weird and controversial, but I remember him doing a good job. Another favorite show of the Restaurant Equipment Baby is Little Einsteins, an educational animated show on Disney that promotes art and music appreciation. Speaking or trains and depots, in one episode called “Go West, Young Train” the team and a train named Loco, go on a mission through the Wild West.